Charleston’s original Presbyterian congregation held prayer services at the old White Meeting House on the site of the present Circular Congregational Church, sharing the meeting house building with other “Dissenters” (Protestants who did not accept the supremacy of the Church of England). In 1731, they moved to their present location at the corner of Meeting and Tradd streets, bulding a wooden “kirk” at the southeast corner of the lot. Being the initial group of Presbyterians to establish an independent congregation, they called themselves First Scots Presbyterian, but because of size restrictions in the old wooden church, a second group pf Presbyterians estalbished another congregation farther up the peninsula in 1809, consecrating their current structure in 1811 as the Second Presbyterian Church. The old wooden “kirk” was replaced in 1814 by the church used by the First Scots congregation today, so technically, the First is the third, and in a literal sense, the Second is the first in age and the First is second. 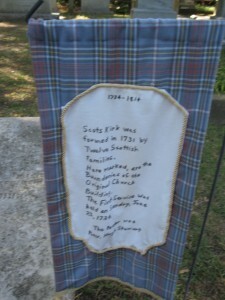 Today, all that remains from the actual First are four tartan cloth markers in what is now the graveyard, marking the four original corners of the church.